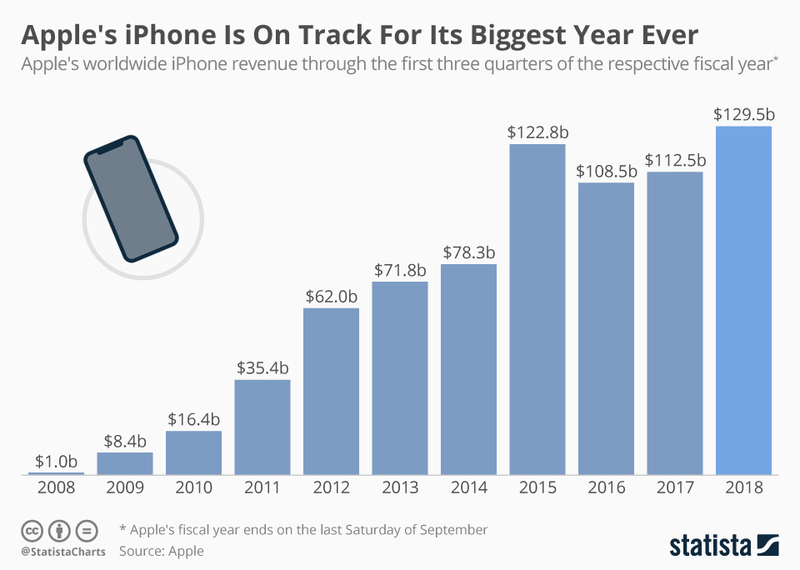 With a magnificent $29.5 billion for the initial 3 quarters of the Apple’s fiscal, it left behind its previous record of $122.8 Billion way back in 2015. Apple broke its own records of previous years with the biggest sales for the year 2018. Although the sales fell short of the expected amounts by the analysts, they were still humongous enough to beat all the past ratings. Huawei surpassed Apple in the global market for smartphones first time in the history, but this did not affect the fact that the company’s flagship product is on the road to the biggest year ever recorded. The smartphone market in its entirety is not showing any appreciable amount of growth, which can be seen in iPhone unit sales as well which are flat for the most part. In this scenario, the decision by Apple to roll out the infamous iPhone X with a price tag of over $1000 last year can be attributed to being the basis of the product’s current success. However, considering the average selling price of the product being $724 in the early quarter of the year, Apple does not even come near to its competitors in regard to the market for the smartphones. Apple, being one of the leading brand, no matter, keeps showing its worth repeatedly as it breaks its own records and stay being a favorite among the consumers.